Upper West Side Manhattan, NYC, photo courtesy of morningside-heights.net. Note: Although the Amazon page shows the K95 1.1 package and a 2000 release date, the product is indeed K95 2.1. Platforms: Microsoft Windows 95, 98, ME, NT, 2000, XP, 2003 Server, Vista; Windows 7, 8, and 10; Windows Embedded Standard; IBM OS/2. Buzzwords: GUI, SSH, FTP, SSL, TLS, PKI, HTTP, SOCKS, TAPI, LAT, SRP, COTS, Unicode, Kerberos, Secure Scriptable Telnet, FTP, and SSH. Online manual: CLICK HERE (new 30 March 2011). This page last updated: Wed Jan 25 12:48:39 2017 || Highest rating - Tucows.Com. New OpenSSH release 7.4 breaks K95's SSH client. The only ways to work around this are (a) enable the old ciphers in the server, or (b) release a new version of K95; volunteer Windows C programmers needed. There will not be a new release of Kermit 95 from the Kermit Project and technical support will not be available after June 30th, 2011. See the announcement HERE. Single copies of Kermit 95 will continue be available from retail sources such as Amazon.com and e-academy (see buttons above). Bulk licenses can be ordered (without technical support) from Columbia University Technology Ventures. The source code has been released with the Open Source Simplified BSD License, except for any modules containing code that is proprietary to other companies. Kermit 95: Internet and serial communications for Microsoft Windows® 95, Windows 98, Windows ME, Windows NT (4.0 and later), Windows 2000, Windows XP, Windows Server 2003, Windows Vista, Windows 7, Windows 10, and IBM OS/2 from the Kermit Project, offers you text-based terminal connections to Unix, VMS, and many other kinds of hosts, allowing you to interact directly with their shells and applications, to transfer files, and, if desired, to automate interactions and file transfers with its built-in platform- and transport-independent scripting language. Internet Virtual Terminal Connections: SSH, Telnet, Rlogin, SSL/TLS. Built-in secure, scriptable command-line FTP and HTTP Internet clients. Lockdown features for creating captive sessions. Active and Passive FTP modes. HTTP Proxy and SOCKS4 firewall traversal. Modem and serial port connections. Built-in terminal emulator supports more than 40 different terminal emulations. Kermit, FTP, XYZMODEM, and "ASCII" file-transfer protocols. An Internet-accessible service for remote access. International character-set translation including Unicode. Full scripting and automation of all the above. Easy graphical one-time setup of all your connections. What sets Kermit 95 apart from other Windows communications packages? Its unique combination of security options, connection methods, protocols, character-sets, customizability, and scriptability, plus the sheer number and accuracy of its terminal emulations. And we don't only "do Windows" -- we also provide compatible software for Linux, FreeBSD, OpenBSD, Solaris, AIX, HP-UX, VMS, and lots of other platforms. Learn the Kermit command and scripting language once, use it on many kinds of connections and on many kinds of computers and operating systems: past, present, and future. Kermit 95 is used all over the world in the academic, government, corporate, and nonprofit sectors. In the private sector, K95 is a favorite of consultants, system integrators, and makers of high-tech equipment, who bundle it with their products or services. In the health-care industry, it's widely used for insurance claim submission as well as in hospital information systems, laboratories, and medical devices; in the retail market, it's used for inventory, POS, and EDI applications; in libraries for catalog access and back-office work; in any large organization, it's a handy network monitoring and management tool. It's popular internationally for its comprehensive character-set support. In every sector, its security features make it ideal for remote maintenance of secure websites and for any critical or sensitive text-based applications -- as well as for such simple tasks as reading your e-mail without catching a virus. THE DIALER The graphical Dialer configures and launches all your connections (dialed or network, secure or clear-text, terminal or FTP) by means of menus, buttons, and dialog boxes so you don't have to deal with complicated initialization files, macro definitions, commands, or "syntax" of any kind. The Dialer can configure as many different connections as you want, and can manage multiple simultaneous active connections. For added convenience, the Dialer can create desktop or Start-menu shortcuts for your most frequently used connections. The actual work -- communications, file transfer, scripting, etc -- is done by the K95.EXE program, similar to its cousins on UNIX, VMS, and MS-DOS, which is normally (but need not be) launched from the Dialer pushbutton-style to make each of your connections automatically with all the appropriate settings and desired customizations. The graphical Dialer removes the need to interact directly with the command prompt in most cases. Yet all the commands are there in case you need them . . . or if you want to script them. Thus the Dialer configures, organizes, launches, and manages your connections, and K95 does all the real work. Beginning with Version 2.0, the connection engine comes in two forms: Graphical User Interface (GUI), K95G.EXE (Windows only, not OS/2), and Console, K95.EXE. Previous releases were available only in a Console version. For a detailed description of the new GUI version, CLICK HERE. In Windows 95/98/ME/NT/XP/2000, PATHWORKS-32 7.0 or later is required. In OS/2, DEC PATHWORKS 2.0 or later (which is no longer a product) is required. SSH v1 and v2 connections (next item) as well as Secure Telnet and FTP connections using Kerberos IV, Kerberos V, SRP, SSL/TLS, or public/private key-pair protocols for authentication and encryption when the host is equipped with compatible servers. (Export to certain countries restricted; SSH and Kerberos not available for OS/2.) (CLICK HERE for a survey of secure Telnet and FTP servers.) K95 2.1 is compatible with the standard OpenSSH, OpenSSL, Kerberos, and SRP libraries and interfaces, and supports Telnet Forwarding of Authorized X Windows System session data over secure connections. Version 2.1.3 adds the new ability to set up "captive" sessions for users by hiding the Tool bar, Menu bar, and/or Status bar, disabling scrollback, and blocking access to the command window, the Dialer, and other external applications. Sessions can now be preconfigured as Minimized, Maximized (full screen), or Normal Window. Based on OpenSSH 3.0.2p1, K95's built-in SSH client (for Windows only, not OS/2) supports SSH versions 1.3, 1.5, and 2.0 and with a full range of authentication methods including password, public/private key pairs, Kerberos 4, Kerberos 5 GSSAPI, and SRP, as well as with external SSH agents. Like all K95's other connection methods, it is fully scriptable. It supports all the same terminal emulations and features as K95's Telnet, Rlogin, and modem clients: character sets, key mapping, scrollback, mouse actions, etc, and is fully integrated into the K95 Dialer as well as K95 itself. CLICK HERE to read about Kermit 95's new SSH client. As of version 2.1.3, SSH Agent Forwarding is also supported. Secure Kerberos 4/5, SSL, TLS, or SRP connections as well as traditional non-secured ones. Character-set conversion including to/from Unicode. Flexible file selection (name, name list, name pattern, date, type, size, exception list). File collision options for downloading. Secure HTTPS connections as well as non-secured HTTP ones. Support for both one-shot and persistent connections. Ability to establish proxies for firewall traversal. Access to header information such as timestamps. Both HTTP and FTP are fully scriptable, allowing (for example) automated secure updating of (or from) remote Web or file archive sites. An intelligent phone-list that understands the difference between international, long-distance, local, toll-free, and internal PBX calls, and adjusts itself according to your location; that allows multiple phone numbers for a single service; and that can be told how many times and how frequently to redial if the connection is not made. North American 10-digit dialing is supported. Numeric and alphanumeric paging too. Direct Kermit-to-Kermit connections by serial port, dialup, or Internet. What's a Terminal??? Click here to find out. URL hot spots, automatically highlighted, ready for "Ctrl-Clicking"
Unicode-based terminal sessions for many languages at once, even in Win9x/ME. The fastest and most advanced implementation of the Kermit protocol available anywhere: Sliding windows, long packets, control-character unprefixing, locking shifts, character-set translation, an update feature, recovery of failed transfers from the point of failure, automatic per-file text/binary mode switching, recursive directory-tree transfer, timestamp preservation, Kermit Streaming Protocol, and much more. Kermit 95's command screen is similar to a Windows Command Window, allowing you to obtain directory listings; copy, rename, and delete files; create and remove directories; search for text in files; display files on the screen, and so forth, but with more commands and options than Windows, a friendlier interface (file and keyword lists on demand, file and keyword completion, built-in help) and full scriptability. The same file management features are also available for managing remote files over a Kermit (or, to some extent, an FTP) client/server connection, and many of them are tied into the file transfer process itself; for example, providing the ability to atomically "move" a file from one computer to another. Internet Kermit Service (IKS) is an Internet file-transfer and management client/server protocol similar to FTP but with more features, security, and automatability. It is described in Internet RFCs 2839 and 2840. 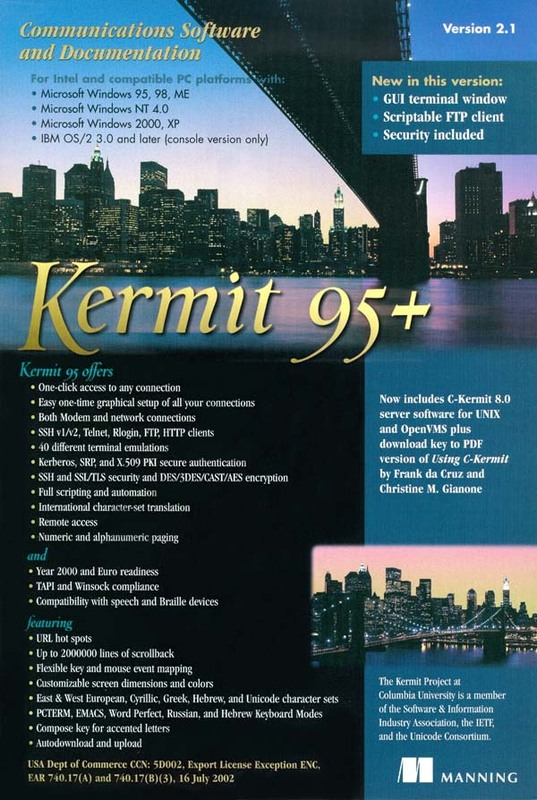 Kermit 95 can act as both an IKS client and (in Windows NT/2000/XP/2003/Vista only) an IKS server, allowing controlled and manageable remote access to your PC from the Internet. For further information see the Windows IKS User Guide, the Windows IKS Administrator Guide, and the Unix IKS User Guide, Unix IKS Administrator Guide. K95's command and script language allows not only for the automation of routine or complicated tasks, but also an unparalleled degree of customizability so you can tailor it to fit into any setting. The same intuitive and portable language is in widespread use on hundreds of other platforms: Automatic programmed interactions with other computers, services, or devices: wait for strings or patterns (one or more simultaneously), respond with other strings; make decisions based on the success or failure of any command, host input, or other criteria. Macros, block structure, built-in and scoped user-defined variables and arrays, associative arrays, string manipulation and arithmetic functions, date-time arithmetic, user-defined functions, file manipulation and access, IF-ELSE, FOR, WHILE, SWITCH, GOTO, and much more. You can even have Kermit write scripts for you by watching and recording your interactions with the host. CLICK HERE for an introduction. Character-set conversion during both terminal emulation and (a unique feature of the Kermit protocol) file transfer: All major West European, East European, Greek, Cyrillic, and Hebrew character sets are supported, plus Unicode UCS-2 and UTF-8. And, for file transfer only, also various Japanese Katakana and Kanji character sets (JIS, Shift-JIS, EUC). CLICK HERE for a list and HERE for some screen shots. A user-friendly online manual manual plus (with shrinkwrapped retail copies only) a comprehensive technical reference manual, also available separately. Technical support via e-mail (through June 20, 2011, only). 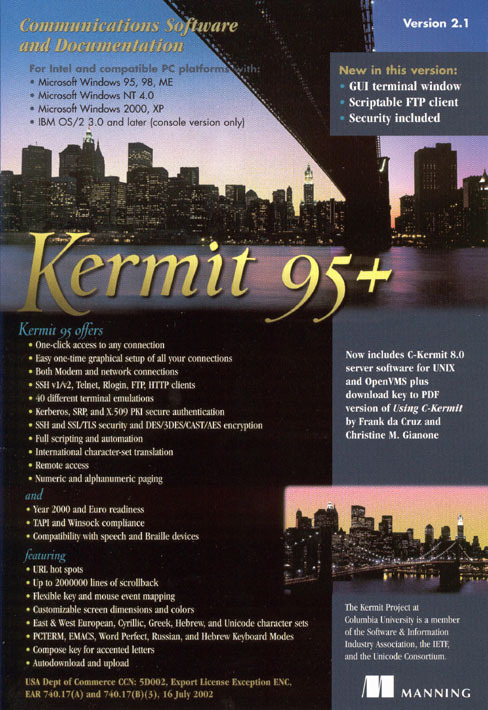 Kermit 95 2.1 is available for Windows 95, 98, ME, NT 4.0, 2000, XP, 2003 Server, Vista, and 7 on Intel and compatible PC platforms only (32-bit or 64-bit), and for IBM OS/2 3.0 and later. The Windows NT PowerPC edition of K95 was frozen at version 1.1.16 after Windows NT itself was discontinued for the PowerPC. The Alpha/NT edition was frozen at version 1.1.20 after Alpha/NT was discontinued by Compaq and Microsoft. The Windows NT 3.5x version is also frozen at 1.1.20 [K95.EXE 2.1.3 -- the Console version, not the GUI version -- seems to work on NT 3.51, as does the Dialer, but we will not necessarily be able to support it]. Kermit 95 is not available for Windows CE, Pocket PC, or Windows Mobile. In a free downloadable full-featured TRIAL VERSION, CLICK HERE to download. Electronically purchased and delivered from e-academy.com (Windows version only, not OS/2). Academic discounts available for university affiliates. This is the fastest and cheapest -- and recommended -- way to obtain Kermit 95 in single or small quantities. NOTE (5 March 2009): E-Academy has moved to www.onthehub.com. The new Kermit 95 download link is http://www.onthehub.com/kermit. The previous download link, http://www.onthehub.com/kermit automatically redirects to the new site). Note that these sites might list only Windows 95, 98, ME, NT, and 2000 as the supported operating systems, but Windows XP, Windows 2003, and Windows Vista and Windows 7 are also supported. Retailers may also order shrinkwrapped copies from Columbia University Technology Ventures. Contact techventures@columbia.edu and mention Kermit in the subject line. While supplies last. Any lifetime academic site license (these are no longer available but existing ones are still valid). CLICK HERE to access the K95 2.1 upgrade. Export of cryptographic software is restricted by United States of America Export Administration Regulations. This is a matter of USA law, which governs the New York based Kermit Project. Export Control Classification Number (ECCN): 5D002 (Telecommunications and Information Security - Software), Paragraph C.1. Export License Exception ENC (Encryption Commodities and Software) under Sections 740.17(A) and 740.17(B)(3) of the United States Export Administration Regulations (EAR). If your software outlet does not carry Kermit 95, ask them to order it. Retailers may order the Kermit 95 shrink-wrapped package from the publisher, Manning Software, directly. Windows NT is a trademark of Microsoft Corporation. OS/2, Warp, and Merlin are registered trademarks of International Business Machines Corporation. Kerberos is a trademark of Massachusetts Institute of Technology. SRP is a trademark of Stanford University. The Kermit Project hosted by Panix.com / kermit@kermitproject.org / This page created 23 September 2011.